This standard has been called the media industry’s equivalent of the UPC code. Ad-ID and EIDR will enable advertising and content identifiers to remain embedded throughout the media distribution ecosystem. SMPTE®, the organization whose standards work has supported a century of advances in entertainment technology, today announced published standards for binding Ad-IDs to commercials and Entertainment ID Registry (EIDR) codes to programming content. The standards specify use of Kantar Media’s audio watermarking technology, an open solution available for licensing. The SMPTE 24TB Open Binding of IDs Drafting Group created and published two new sets of standards and recommended practices: ST 2112-10 and RP 2112-11 for the Open Binding of Content Identifiers (OBID) and ST 2112-20 and RP 2112-21 for the Open Binding of Distribution Channel IDs and Timestamps. The availability of these standards for persistent binding of identifiers into advertising and programming content establishes a fundamental building block for the advancement of full cross-platform measurement and content integration. Supporting real-time identification of a piece of content or an ad — whether on a TV set, in a set-top box, or outside of the set using a metering device or smartphone app — the standards will help mitigate numerous inefficiencies in the cross-platform video distribution and measurement workflow, including time-consuming, legacy processes for matching program and ad names back to the time of airing and the distributor. The ability to embed standardized identifiers throughout the media ecosystem will have a significant impact on the efficiency of cross-media workflows for ad agencies, media companies, and marketers. Television networks and digital content publishers will also be better equipped to create integrated multiscreen experiences. By facilitating faster reporting for ad verification and audience measurement, the use of standardized identifiers will eventually enable marketers to better optimize live and on-demand advertising much as they now optimize online advertising. Kantar Media’s audio watermarking technology was recommended as the standard by a SMPTE Standards Drafting Group, supported by Ad-ID, a joint venture of the Association of National Advertisers (ANA) and the American Association of Advertising Agencies (4As); EIDR, an industry association operating a registry of over 1 million unique, global identifiers for digital entertainment assets, including motion pictures and television content; and CIMM, whose members represent leading content owners, large advertisers, and media buying agencies. This joint initiative, known as Trackable Asset Cross-Platform Identification (TAXI) Complete, was launched by CIMM in 2013 to standardize video asset identification. The effort is now being spearheaded by Kantar Media, whose audio watermarking technology enables tracking of advertising and programming content across platforms seamlessly and automatically, in effect making those solutions more complete. Kantar Media is a global leader in media intelligence and audience measurement. Deployed by hundreds of broadcast networks across the world, the company’s audio watermarking technology is an industry-leading solution for content detection. Information on licensing of Kantar Media’s audio watermarking technology is available at kantarmedia.com/us/campaigns/taxi-complete. The new SMPTE standards are available for purchase from the SMPTE digital library at ieeexplore.ieee.org/browse/standards/number/smpte/?queryText=OBID [ieeexplore.ieee.org/browse/standards/number/smpte/?queryText=OBID __title__ http://ieeexplore.ieee.org/browse/standards/number/smpte/?queryText=OBID . A link to the SMPTE podcast, “Standards for Binding IDs to Media Assets Using Audio Watermarking Technology” is available at soundcloud.com/smpteconnect/obid/. Ad-ID is the industry standard for identifying advertising assets across all media platforms. The web-based system is a central, secure source for the industry’s asset identification information and ensures that all assets are delivered correctly to media and consumers. Ad-ID is a joint venture of the American Association of Advertising Agencies (4As) and the Association of National Advertisers (ANA) and serves more than 2,000 advertisers of all sizes and most advertising agencies in the United States. For more information visit Ad-ID.org or follow Ad-ID on Twitter @Adidentify. EIDR (Entertainment ID Registry) is a universal identifier system for movie and television assets built to enable the automation of entertainment commerce and to increase the availability of quality data for analytics. EIDR provides a highly curated database that addresses commercial workflows by uniquely identifying assets ranging from top level titles to edits, digital encodings and franchises. EIDR IDs are already in commercial use in various reporting and measurement applications. For more information about EIDR, please visit eidr.org. The Coalition for Innovative Media Measurement (CIMM) is comprised of leading video content providers, media agencies and advertisers that aim to promote innovation and foster efficiencies in audience measurement for television and cross-platform video. CIMM explores and identifies new methodologies in audience measurement and verifies these approaches through a series of pilot tests and studies conducted with independent measurement companies. CIMM’s primary focus is on two key areas: the current and future potential of television measurement through the use of return-path data, and new methods for cross-platform media measurement. Learn more at cimm-us.org. Kantar Media is a global leader in media intelligence, providing clients with the data they need to make informed decisions on all aspects of media measurement, monitoring and selection. Part of Kantar, the data investment management arm of WPP, Kantar Media provides the most comprehensive and accurate intelligence on media consumption, performance and value. For further information, please visit us at kantarmedia.com. For more than a century, the people of the Society of Motion Picture and Television Engineers, or SMPTE (pronounced “simp-tee”), have sorted out the details of many significant advances in media and entertainment technology, from the introduction of “talkies” and color television to HD and UHD (4K, 8K) TV. Since its founding in 1916, SMPTE has received an Oscar® and multiple Emmy® Awards for its work in advancing moving-imagery engineering across the industry. SMPTE has developed thousands of standards, recommended practices, and engineering guidelines, more than 800 of which are currently in force today. SMPTE Time Code™ and the ubiquitous SMPTE Color Bars™ are just two examples of SMPTE’s notable work. 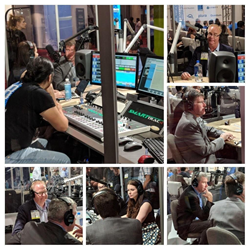 As it enters its second century, SMPTE is shaping the next generation of standards and providing education for the industry to ensure interoperability as the industry evolves further into IT- and IP-based workflows.